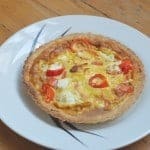 This recipe is one that I’ve made up as I went along – taking from other quiches in little quantities here and there; the pastry though comes from my Great British Bake Off book, as I can still never remember the proportions of the ingredients. It makes enough for two small quiches, each serving two. So it’s either quiche for four, or one for now and one for the freezer. Make your pastry by putting the flour and salt in a bowl then cutting the butter into cubes and adding it in. Toss it all together using your hands, then rub it all through between your finger tips and thumbs so it becomes the texture of breadcrumbs. Pour the water in gradually, you want to use enough to just bring the crumbs together into a dough. Once together wrap in clingfilm and rest in the fridge for 20 minutes so the butter hardens again. After it’s chilled, roll out the dough on a lightly floured work surface, then press into your tart dish (or dishes, depending on the size you use). Push down into the base, and trim at the top – if you’re using a metal fluted dish you should be able to just push down on to the edges for it to cut. Spike the bottom all over with a fork and bake in the oven at 200ºC for 10 minutes, or until a very light gold. Blind baking like this will avoid the embarrassment of a soggy bottom later on. Finely dice your onion – the smaller the pieces the better – and then slice your pepper (in half down the middle and the horizontally into 1-2cm chunks). Using a heavy based frying pan, heat up the oil and use it to soften the onion. Once almost softened, add in the pepper and fry for about 2 minutes on a medium heat to start cooking the peppers. Set aside to cool a little. In a jug, beat your eggs and then whisk in the milk, flour and seasonings – whisk thoroughly together ensuring there are no lumps from the flour. Add the onion and peppers into the just and mix once more, then pour into the prepared pastry case(s). Scatter small lumps of goats cheese all across the top. Bake in the centre of the oven at 180ºC for 15-20 minutes, or until golden and firm on top.